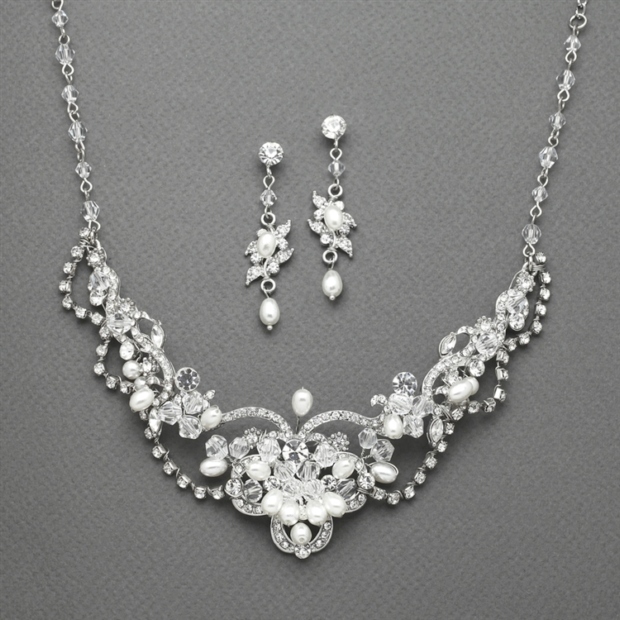 * Mariell's glistening Pearl Wedding Necklace & Earrings set has a crystal studded abstract motif. * The adj. 15" - 18" necklace is 1 1/2" h at the center. * The 1 1/2" h dangle earrings complete our freshwater pearl set sold at a great wholesale price! * Mariell's shimmering Soft Cream Freshwater Pearl and Crystal Wedding Necklace set is a great addition to your store's Bridal Jewelry showcase. * Our wholesale necklace and earrings set is both affordable and elegant. * The neck has a flattering chevron shape with abstract waves of rhinestone, freshwater pearls and genuine crystal sprays. * The slender dangle earrings are will make them the perfect statement for that first wedding dance!